and backs, the sashes having been stiffened with lots of starch. I definitely need to figure out how to buy yardage for a longer sash for the size 4 dress on the right. I like the sash to just hit the hem, as in the smaller size. Well, I can figure it out, just need to write it down so I have it when buying fabric. I gathered and sewed the overskirt separately from the dress so it would be "poufier", and both my sister and I are pleased with the result. It also has the advantage of being easily removable so I could add a completely different overskirt if desired at some point in the future. Next up, garter for the bride. The basic flower girl dresses are complete. This is a toddler large, for my great niece. My sister thought it wasn't poufy enough, so I added an extra ruffle to the tulle later. The dress is constructed with a lining and a layer of tulle between the lining and skirt. Luckily I had just enough tulle to make a 2/3 length ruffle to add to the existing tulle. Here it is, much more poufy. Rather difficult to photograph a white dress, isn't it? The fabric, a polyester shantung, is somewhat difficult to work with as it ravels just as much as silk does. I self lined the bodices but used lining fabric for the skirts. Now this one, for my granddaughter, is a size 4. Any more poufiness would look silly. I think the light purple overskirt will add enough volume. This pattern has three skirt panels, which I find weird. I wish I had paid more attention to it before I cut it out so I would have put the front on the fold. Oh well, I won't do this with the overskirt. Obviously, they both need a good pressing. I've been really interested in couture sewing techniques lately. Here I've handpicked the zipper instead of sewing it in by machine. It really is so much easier and doesn't take too much longer. I also understitched the bodice linings by hand. I love hand sewing so I think it's fun. Eventually I'll write a post about the dress I made for my son's graduation that I will also wear to this wedding (and maybe another in August). Retirement is just wonderful. I'm so relaxed, but not two weeks in I caught a ghastly cold. It hit me Tuesday afternoon, while I was getting ready to host our local SAGA guild as the regular hostess is away. It just seems to be getting worse each day. This morning I woke with laryngitis and can't say a thing above a whisper. I've been living on hot tea and cough drops. Time to get the grill ready for the Father's Day steaks. I'm making a tomato and avocado salad while our son makes cornbread. Grilled pineapple wedges for dessert. Next up: the overskirts, sashes, and hair bows. My niece is getting married at the end of June, so for the next few weeks I'll be very, very busy making these two flower girl dresses. McCall's 5791 for my great niece who is about 18 months old, and the Simplicity 3943 in a size 5 for my granddaughter, now 5 years old. These are not heirloom dresses, they have zippers in the back but are lined. The dresses will be the ivory shantung on the right, with a purple sash and the flowered organza on the left for an overskirt. I'll be making the sleeveless version, with no collar and in tea length. I'll definitely make the brain squeezer for the littler one. These are all synthetic, polyester for the shantung and the organza fabric, nylon for the purple sash fabric. Early in May I gave the bridal shower, we managed a sit down lunch on the patio. Very simple place settings. And my black bean and corn salad in cucumber cups. Individual ham and cheese quiches (this was a test batch the week before the shower). Cookies for dessert! (we don't go in for the traditional cake). 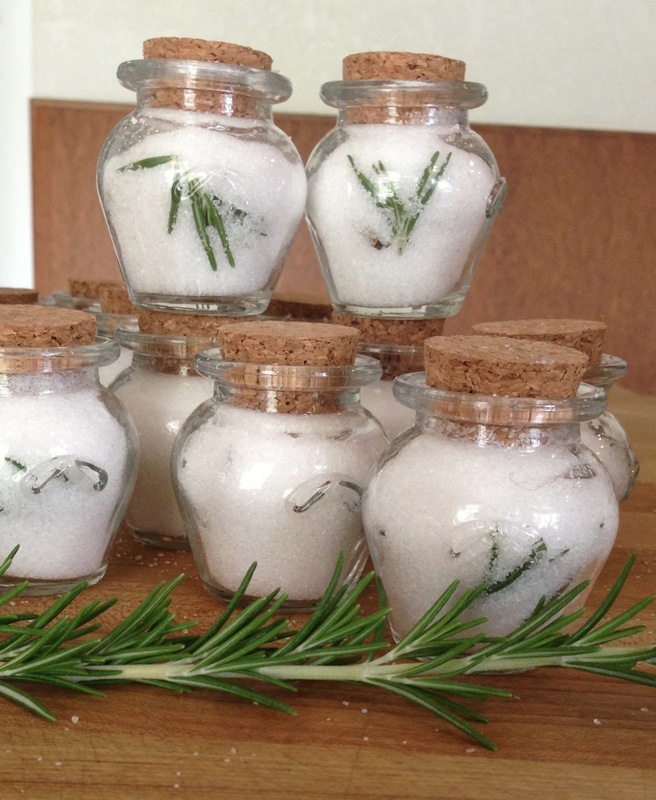 Finally, a jar of rosemary salt for each guest to take home. This was as I was making them up, you can see the spilled salt on the table. I eventually tied a bit of twine around the neck of the jars for sort of a country look. Now that I'm retired, I'm trying to schedule my days so I don't just hang around and not get anything done. So first thing in the morning I go for my walk/run, then garden for a few hours to take advantage of the Southern California June Gloom. A bit of housework and that pretty much takes care of the morning. The afternoon is devoted to sewing and stitching related activities, or an occasional errand. So, time to cut out a dress!